Our Jumbo Cornish X Rock (Cornish Cross) is the most remarkable meat-producing chicken we offer. Special matings produce baby chicks with broad breasts, big thighs, white plumage, and yellow skin. 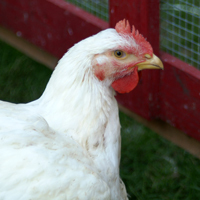 These broilers are known for their remarkable, rapid growth and feed efficiency.